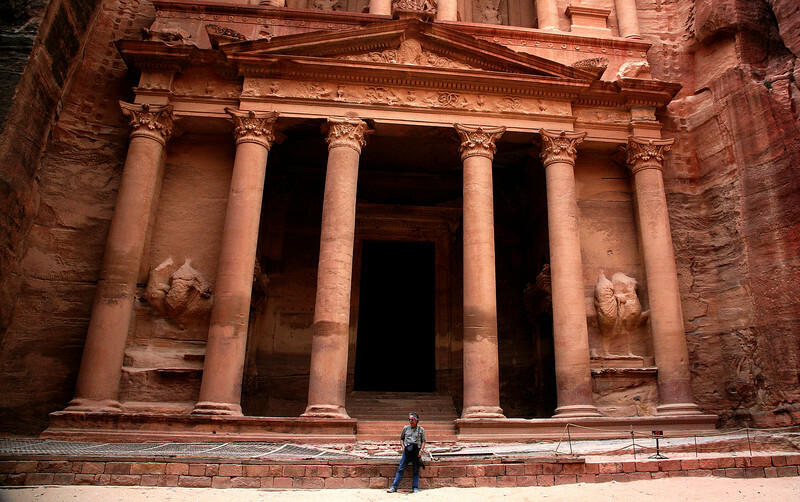 In 2007 a Swiss-based organization called "New Seven Wonders Foundation" conducted a worldwide poll and pronounced Petra one of the seven wonders of the world. Although some claim the vote was rigged, I had always wanted to visit the 2000-year-old Nabataean rose-red city in southern Jordan. I loved the story of Louis Burckhardt, the ambitious Swiss explorer who died shortly after re-discovering the abandoned ruins in 1812, and romantic Victorian lithographs by Scottish painter David Roberts, who arrived 27 years later with his sketchbook and paintbox. T. E. Lawrence came by in 1914, and Obama dropped in by helicopter in March 2013, just days before my arrival. Like Abel Simbel, Ellora, Mt. Rushmore and the Longmen Grottoes, Petra was carved out of living rock, and uniquely, from the pink sandstone of the Arabian desert. Finally, as many more people recall, it was where Indy saved his father in the third Indiana Jones movie, and found the Holy Grail. Petra is one of those places that lives up to its reputation, and justifies the crowds arriving each morning by bus from Amman. So here it is, in that peaceful little country stuck between warring giants, the Switzerland of the Middle East, still watched over by the Bedouin that have roamed its hills for thousands of years. When you walk through the narrow winding Siq, an awesome natural canyon that amazes you before you even see the ruins, and emerge before the Treasury, it is truly "one of the wonders of the world." "A rose-red city half as old as time."